The Dark Night of the Soul - Experiencing the Illusion of Separation and the Return to Unity and Oneness. The Dark Night of the Soul is a term used to describe a physical, mental and emotional experience that can occur during the transition phase to remembering who you really are. If I ask, "Who are you?" how would you answer? Would you tell me your name? What you do for a "living" (ie. work for money)? That you are a stay at home mom or dad? Or a student working towards a profession? That you are a business owner? Homeowner? Wealthy of broke? Are you really any of those things? Do you know who you really are? Or, do you know who you THINK you are? The vast majority of us will spend our lives creating an identity for ourselves out of a string of external experiences. We experience ourselves as sons and daughters, brothers and sisters, mothers and fathers, doctors, lawyers, teachers, and soldiers. Employers, employees, black, white, oriental, latino, Christian, Muslim, Jewish, Hindu, atheist... the list could go on and on, and it does. But what happens when we discover the Truth? What if you woke up tomorrow morning to find everything that defined who you think you are - was gone! Would "you" still be there to experience that? Of course you would. And if that happened, you would have a choice ; to try and put together another story about who you think you are... or, to realize you are not the story. The story has vanished, but you are still here. So, who are you? Those who are unaware of the spiritual aspects of the journey must resort to other means of coping with a Dark Night of the Soul. When faced with the loss of some part of who they think they are - perhaps a divorce, job loss. or losing a home - the first line of defense is to replace what was lost; a new spouse, new job, new home, etc. If that cannot be done, attempts to control the inevitable painful feelings with drugs or counseling are common. 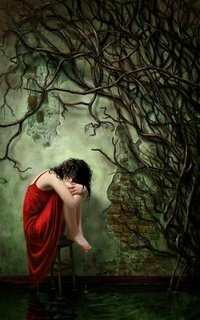 If you are on a spiritual journey, using metaphysics or whatever path you have chosen to discover the true nature of reality, eventually you may encounter the Dark Night of the Soul; that moment when you don't yet know who you are, but you do know what you are not. You may feel lost and alone, powerless and without any purpose or direction in your life. You no longer find any meaning in the stories you used to tell yourself, about why you are here and what it means to be alive. You may have found your own center, your connection to Source, to inner guidance and inspiration - and yet you still don't know who you really are. A Dark Night of the Soul can occur many times in your own life. You might think that you've "got it" - you know who you really are! You are enlightened, powerful, eternal, etc. Then, one day, you realize you just THINK you are all of that. Once again, you may find yourself feeling lost, alone, confused, maybe even hopeless that you will EVER get it "right". The Truth is, who we really are is NEVER what we THINK ! There are no words to describe it. If I ask you, "Who are you?" you simply cannot answer. The only way I can know who you are is to know who I Am - and vice versa. When you know who you really are, you have no need to ask someone who they are. You already know, and they know you know! The Dark Night of the Soul is actually a gift. It is an experience that creates a powerful longing in the Heart - to let go of the illusions, and let the Truth be known. If you can bear it (and you can), allowing your own Dark Night to unfold and fulfill itself can lead to a morning more beautiful and filled with light than you can currently imagine! Just as the caterpillar must surrender to the process of pupating to become a butterfly, we must surrender to the Dark Night of the Soul. We must surrender the Ego Mind so the Heart Mind can emerge. 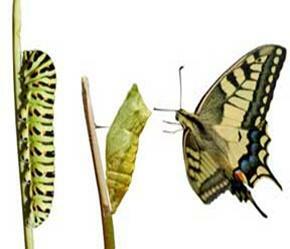 While pupating, the caterpillar is no longer a caterpillar - but it is not yet a butterfly. It is blind, deaf, and cannot move or do anything! Let go and let the forces of nature transform who you THINK you are, so you can remember who you REALLY are. To explore and learn more about the stage of personal transformation we call the Dark Night of the Soul, click the links and watch the videos below. OR, Go Back To: SPIRITUAL METAPHYSICS: Everything Is Connected! A Mind with Heart overcomes the Illusion of Separation and sees the connection in all things. A Mind with Heart has access to infinite energy, intelligence, and Source. A Mind with Heart receives inner guidance and experiences inner peace. A Mind with Heart creates a world of abundance, happiness, and well being. Start creating A Mind With Heart today, and remember who you really are! Life Lesson #28: The Dark Night of the Soul. Available at The Mystic.org, this free lesson takes you step by step through the life experience we call the Dark Night of the Soul. Informative, helpful and supportive if you are going through this experience now or in the future. Navigating While Pupating: Heartcompass Secrets and LifeNavigation Tips. Are we pupating yet? Read this article for helpful tips on how to navigate this challenging phase of spiritual growth. Includes a link to "The Spiritual Life of Butterflies". The Mayan Calendar and 2012. Is our planet going through a "Dark Night of the Soul"? The Mayans created a calendar thousands of years ago predicting the alignment of the Earth, Sun, and Galactic Center. This alignment also occurs at the time when our solar system is at its farthest point away from the Galactic Center. The electromagnetic field of the Earth, the Sun and the human heart are known to be connected and influence each other. Does 2012 on the Mayan calendar mark the end of a cycle of moving away from "source" and a return to a closer connection? Explore the evidence, you decide. Watch 'Dark Night of the Soul' by Humanity Healing. Spiritual Depression and Surrender, a lesson from University of Metaphysical Sciences. Watch more videos at A Mind With Heart Channel on Youtube. The official Youtube channel of Metaphysics For Life. 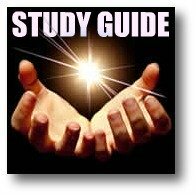 Go Back To: SPIRITUAL METAPHYSICS to learn more.